I recently fell in love with a colourwork knitting pattern – unusual for me, because colourwork is so very fiddly and tedious. Or maybe it’s fiddly and tedious because I don’t often do it? Either way, this is an anomaly. The pattern that caught my eye is this: Lucy in the Sky. While I love pink and brown from an aesthetic point of view, pink – or at least that shade of pink – is definitely not my colour. I normally work socks two at a time, toe up, so this pattern must have worked some kind of hoodoo for me to decide to work a cuff-down sock in stranded colourwork, one at a time. However, my fellow crafters will understand that when the compulsion strikes, you simply must follow it to the conclusion of a (hopefully) successful project! Day 1: Main colour chosen and purchased – a deep, deep teal. Day 2: Contrast colour chosen – I decided to go with a very vibrant green, almost a chartreuse. I didn’t have it in stash, nor did I see it available for purchase anywhere that I could immediately lay my hands upon it. So…to the dye pot! I’d purchased some sock yarn on the cone earlier this year (a great bargain from Webs, by the way…I ordered a pound, and received enough to make 5 pair of socks for $19!) and so I sent The Boy to the store to buy some Kool-aid for me. 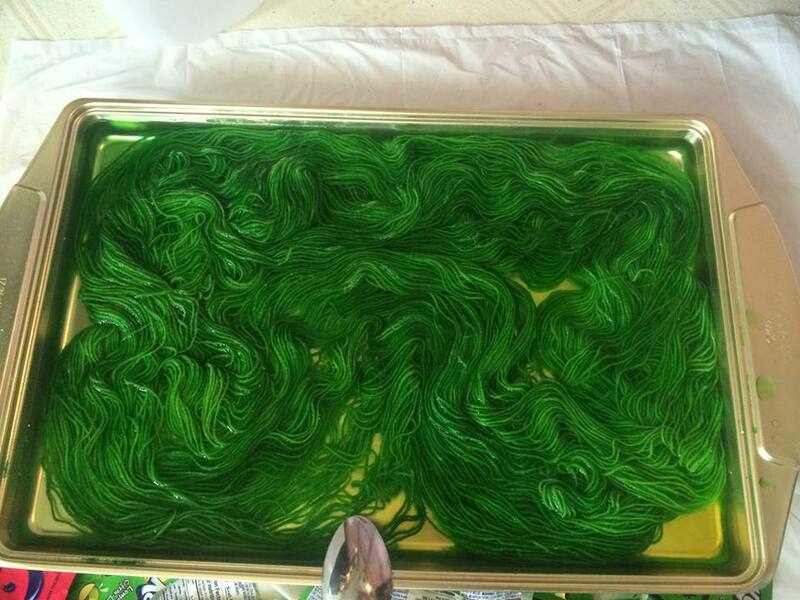 Day 3: So, back into the dye bath it went…with another 8 packs of Kool-aid, and 9 drops of yellow food dye in 1/2c. of boiling water. This turned out *much* better, and after drying it on our deck for several hours, I was able to cast on. Using a tubular cast-on, I started with 72 stitches on a size 0 needle, my usual sock needle. After 4 rounds, I realized that I needed to go up a needle size, and start with 64 stitches for the cuff. One quick frogging later, I was off and running – with a 1X1 rib for the cuff, since I like that better. Opted for 8 rounds total, then began the main pattern, as I don’t care for long socks. Verrry nervously began the colourwork – and discovered that yes, the teal yarn is indeed quite thin (DGB Confetti – Ravelry was right, as usual). Knit until way too late, because it was kind of fun to see the colour changes. Checked the sock over – floats looked great, sock pulled over my foot, no problem. Called it a night at round 19. Day 4: Decided to knit a little bit while I had coffee, spend some time with the kiddo finishing the episode of Warehouse 13 that he crashed while watching the evening previously, before I headed into work. I made it through round 23 on the chart, making very sure to not scrunch my stitches together, to catch the floats every 3 stitches, and to carefully, carefully follow the sequence in the chart. Set it down to look it over, and realized that it was turning out quite well. Mentally patted myself on the back, which is of course the moment it all went pear-shaped. Apparently, even 72 stitches, even when done precisely as it should be with no puckering or skipped stitches…needs to be done on at least a US2 needle. Either that, or I needed to figure out a magical way to shrink my foot, as the socks failed to go over my ankle, just ever so slightly 🙁 So a decision was made to frog back to the first round of colourwork, although I took a few moments to mourn my progress so far. Look at the floats on back! *sob* I worked so hard on those! Day 4 – Part Two, knitting after work. I picked up my now-sad sock, and took a deep breath, and pulled out the needles and started ripping back 🙁 I decided to go back to the last row of ribbing, so that I didn’t change needle sizes in a stockinette portion. Picked up the ribbing again on the size 1 needle, then knit off onto a size 2. I made it as far as row 22 again, before I called it a night, and this time I made a couple of changes. First and foremost, I pulled it on over my ankle every other row or so, to make sure this time that it will fit. Secondly, I changed which hand carried the primary colour, for two reasons: the teal yarn is very thin, and I also wanted the teal to be more prominent than the green. It’s interesting to see the difference it makes in the look of the sock – I knew it would, but since I’m new to colourwork, I’m finding the change novel enough to be intriguing. I’ve already remembered, though, why I usually work socks two at a time. When this is done, I have to make another one! Day 5 – making progress! I didn’t have quite as much time to knit, as I ended up working later – and then of course there’s supper, and straightening up, and the break to overdye some red yarn that I wasn’t quite happy with the first time. It’s now sufficiently bright…it’s destined for the holiday pile of yarn – said pile will eventually be turned into hats and socks and gloves and toys and other assorted gifts. This specific skein will probably wind up as socks for my 10 year old, who is currently really into bright socks. I got about 1.3 inches into the heel flap before I knocked off for the evening. The pattern calls for a stockinette heel flap, but I decided to work an Eye of Partridge heel. I finally finished the heel flap – it seems like that takes forever, on cuff-down socks. Heel is turned, a bajillion stitches picked up (ok, 40, but it felt like more). Striped gusset underway, and the sock actually still fit!